Loves Rubberstamps Blog: Let's Play a Round of...GOLF! My card was actually a really quick card to make. The golf scene was inspired by Michelle Zindorf and I followed her tutorial to create it. I am not very good with the brayer like Michelle is, so I use all sponging instead of using a brayer. 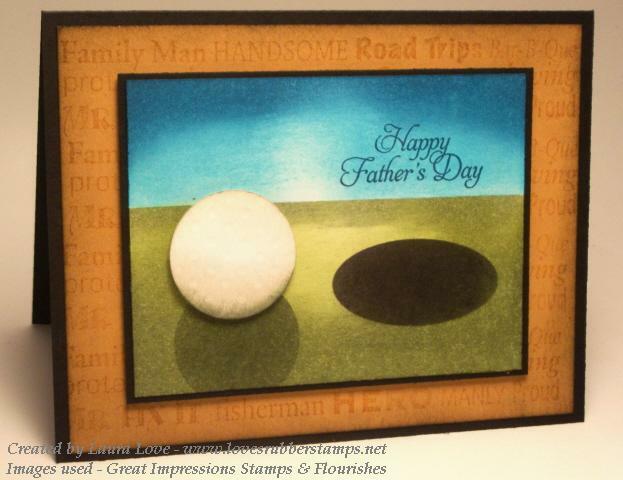 I added the sentiment on the golf scene using the Flourishes stamp set called A Guiding Light. My Stampin Up! More Mustard Layer was stamped repeatedly with the All About Men sentiment stamp from Great Impressions Stamps. I stamped it using the More Mustard Ink because I wanted it to be subtle. 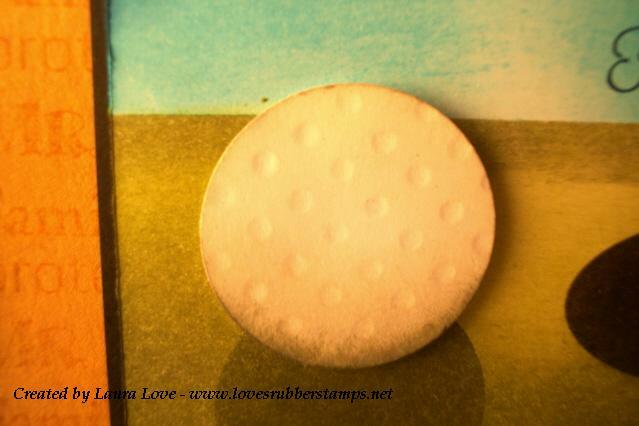 I then sponged the edges with early espresso ink also from Stampin Up! The thing I LOVED about the All About Men stamp is that my more mustard layer is 4" x 5 1/4" and the stamp fit PERFECTLY clear across the front! Here is a close up of my golf ball so you can see it actually has dimples in it like a real golf ball would. You can't see it in the other picture because they are very subtle and the light was not the greatest. Sorry for the yellow tinge on this one, one of my lights burned out in my light box right in the middle of taking pics! My ball is popped up using dimensionals. I also popped the golf scene layer up on dimensionals as well. Really fun and quick card that packs a big "wow"! Hope you play along in our Loves Rubberstamps Blog Challenge! This is SO beautiful Laura!! Gorgeous shading!! OMG Laura that is so drop dead gorgeous!!!!!!!! !